As you’ve probably guessed by now, I’m a complete and total homebody. Always have been always will be. So even after spending an entire workweek at home there’s nothing I love more than spending an entire weekend at home, too. This past Sunday, which I spent mostly in our kitchen, was pretty close to my ideal day at home. I woke up early (thanks DST!) and got started on our meal plan for the week (thanks to my Pinterest boards). I put together a grocery list (I’m loving the GroceryiQ App — thanks for the recommendation Facebook friends) and headed off to Trader Joe’s and Whole Foods. Once home, I got to work unpacking and prepping. I whipped up some two-ingredient applesauce–just apples and cinnamon. I made a pumpkin chocolate chip bread; it was good, but still needs some work. 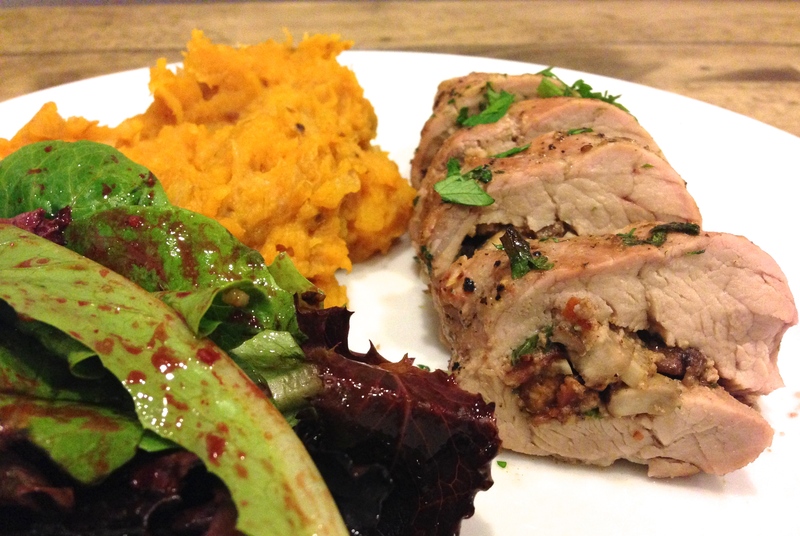 And for dinner there was this mushroom stuffed pork tenderloin. If stuffing any kind of meat sounds as intimidating to you as it did to me, this is the perfect launching pad. The ingredients are straightforward–pork tenderloin, mushrooms, chopped parsley, and breadcrumbs. It comes together really easily and the result is restaurant-quality. I served it alongside this mashed butternut squash that contains sautéed onions, apples, and a blast of spices as well as a simple salad with baby greens and roasted beet. For me, the entire day was bliss, right down to the very last bite. Heat a skillet over medium-high heat and add the bacon. Cook until crisp. Add the mushrooms to the pan, season with salt and pepper. Cook until mushrooms are soft, about 5 minutes. Add garlic, cook 1 minute. Remove skillet from heat and stir in breadcrumbs and parsley. Set aside. Slice each tenderloin almost in half lengthwise and open like a book. Cover the pork in plastic wrap and using a meat mallet or heavy pan, pound until it’s about 1/2 inch thick. Remove plastic wrap. Divide the mushroom mixture evenly between the tenderloins and spread through the middle. Fold one half of the tenderloin over to meet the other. (Alternatively, you can roll up each tenderloin and secure with kitchen twine or toothpicks, but it worked for me just to fold it without rolling.) Rub the pork all over with olive oil and season with salt and pepper. Heat an oven-safe skillet over medium-high heat. Add pork tenderloins and brown on one side, about 5 minutes, then flip and brown on the other side, about 5 minutes more. Place the pan in the oven and cook about 15-20 minutes until pork is cooked through. Garnish with chopped parsley. Let pork rest for a few minutes before slicing. 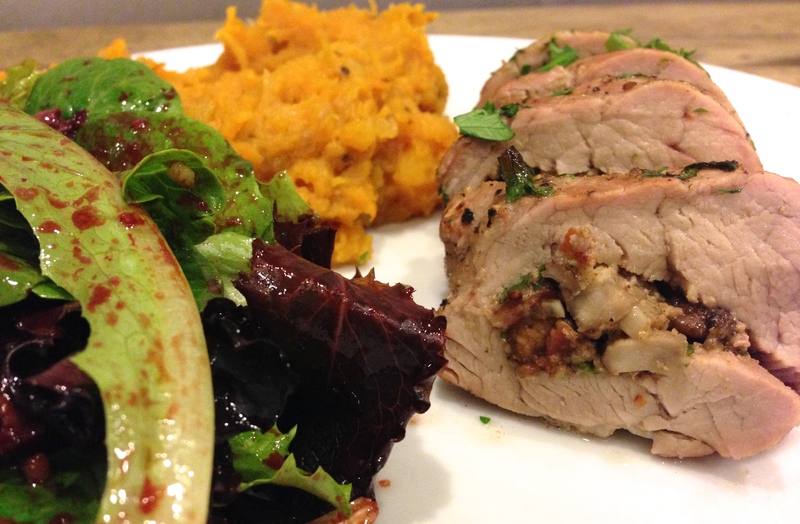 This entry was posted in Meat, Pork on November 7, 2013 by Paige Greenfield.